During pregnancy, your body undergoes a number of physiological changes, including alterations in hormone levels and an increase in blood volume. Your metabolic rate also often rises slowly over the 40 weeks of pregnancy, increasing your calorie needs. Talk to your doctor for personalized diet recommendations. Metabolism refers to the amount of energy -- calories -- required to perform the physical and chemical processes in your body, including breathing, digestion and physical activity. In general, a woman's metabolism increases 15 percent to 20 percent during the course of her pregnancy, according to Patient.co.uk. However, not every woman experiences an increase in metabolism. Changes in your metabolism depend on your pre-pregnancy nutrition and the weight of the baby. If you are underweight when you become pregnant, your metabolism may slow down to conserve energy, according to an article from 2000 published in The American Journal of Clinical Nutrition. If your baby is large, your metabolism may increase to meet the baby's demands. The number of calories you need to eat during your pregnancy reflects your metabolic needs and varies from trimester to trimester. 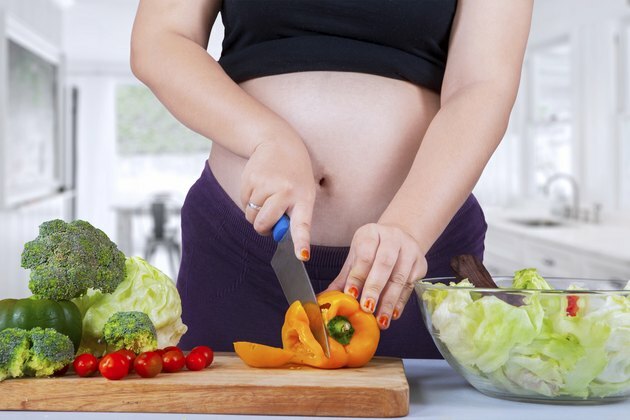 Calorie needs during pregnancy generally range from 2,200 calories to 2,900 calories a day, according to the Academy of Nutrition and Dietetics. If you're at a healthy weight at the start of your pregnancy, you do not need to eat additional calories during the first trimester. To meet the calorie needs of your growing baby, your needs during the second trimester increase by 340 calories a day and during the third trimester by 450 calories a day, says AND. Whatever your starting weight, you can expect to gain weight during your pregnancy. The amount of weight you need to gain depends on your body mass index, or BMI. A woman with a BMI of 18.5 or less is expected to gain 28 pounds to 40 pounds, a woman with a BMI of 18.5 to 24.9 is expected to gain 25 pounds to 35 pounds, while a woman with a BMI 25 or greater is expected to gain 11 pounds to 25 pounds. Closely monitoring your weight and dietary intake may help you see how your metabolism changes throughout your pregnancy. While you may get to eat more calories when you're pregnant, it doesn't mean you get to eat more cake and pizza. In addition to those extra calories, your nutrient needs also increase during pregnancy, so you need to eat more nutrient-rich foods. A healthy diet for you and your growing baby should include whole grains, fruits, vegetables, lean sources of protein such as poultry and beans, and low-fat or nonfat dairy.